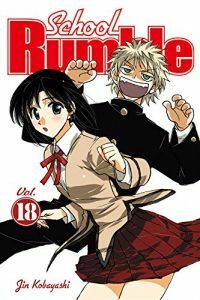 SEAN: Unlike Viz and Yen, Kodansha doesn’t usually pile it all on in one week. That said, hope you like Kodansha this week. But first, J-Novel Club has a 2nd volume of Playing to Win in a VRMMO, the bulk of which is apparently a flashback to the time gap in the first book. Kodansha continues to pump out digital-only series, both new and old Del Rey castoffs. For the former, we have the 2nd Ace of the Diamond, another Museum, and the second Tokyo Tarareba Girls. For the latter, new volumes of Gakuen Price, School Rumble, Yagyu Ninja Scrolls and the omnipresent Pumpkin Scissors. MICHELLE: I kind of fell behind on keeping up with these, alas. ANNA: I bought the first volume of Tokyo Tarareba Girls but haven’t read it yet, so far behind already. ASH: I don’t know how much it really means, and I’m trying not to get my hopes up lest they be dashed, but Kodansha actually called some of these titles digital-first recently. I’d love to see more print editions! SEAN: And there’s lots of print as well. Attack on Titan is so popular it’s not getting a Choose Your Own Adven… (cough) sorry, Choose Your Own Path Adventure, a totally not-litigious title, called Year 850: Last Stand at Wall Rose. SEAN: Fairy Tail is up to Vol. 59, but I believe that this may be the final arc. The Prince in His Dark Days is at Vol. 4. Are the days still dark? MICHELLE: I believe this is the final volume, too. SEAN: Princess Jellyfish’s 4th volume is probably the release I’m most excited about in this bunch. ASH: Still incredibly happy this series is being released! SEAN: But there’s also the debut of a new Kosuke Fujishima series. 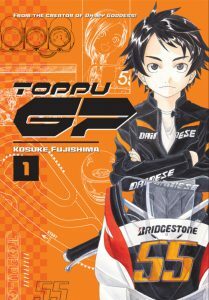 Toppu GP is the somewhat awkward title, and after combining fast bikes/cars with policewomen, goddesses and college kids, Kodansha is finally letting him actually do a racing manga. Should be fun. MICHELLE: Huh. I suppose I should check it out. SEAN: Seven Seas has a 5th volume of Not Lives, which I have Not Read in some time. And a 7th volume of my “favorite” guilty pleasure (and by favorite I mean it makes me cringe so much but I read it anyway) Pandora in the Crimson Shell: Ghost Urn. ASH: I find the series’ supposed romance much less compelling than its behind-the-scenes portrayal of the shoujo manga publishing industry. SEAN: And Vertical gives us a 6th volume of Devil’s Line. Lastly, there’s some more Viz. We have a 62nd volume of Case Closed. Catch up before you’re 63 volumes behind! And a 20th Itsuwaribito, which I think may be nearing its end soon. Magi reaches Vol. 23, and always makes me happy. ANNA: So, so far behind on this title as well. SEAN: And a 7th volume of Monster Hunter: Flash Hunter. Lastly, the Revolutionary Girl Utena box set which got delayed at the last minute is now out in stores (unless Diamond shipped it to you early, like they did me). It’s the shoujo manga version of Utena, and I will leave it at that. ASH: I actually haven’t read the series, but I have read the standalone manga The Adolescence of Utena which I loved and which is also included in this absolutely gorgeous box set. SEAN: There’s a lot of variety this week. What appeals to you?